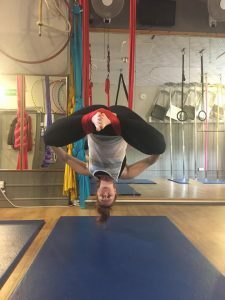 Katy has been attending lots of different classes at Tempest for over 7 months, she has a positive attitude and always helps out at the start and end of classes. Why did you decide to start pole/aerial? I wanted to do something that combined exercise with fun and that was a bit different. I saw a friend’s pictures on Instagram and was desperate to give it a try. 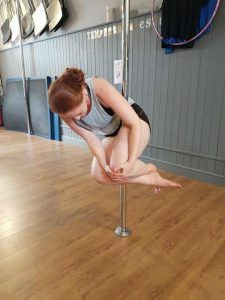 Did you do any other dancing/fitness before starting pole/aerial? I previously did ballroom, Latin and classical dancing. I also do Pilates and had done some TRX workshops. How long have you been taking part in classes at Tempest? 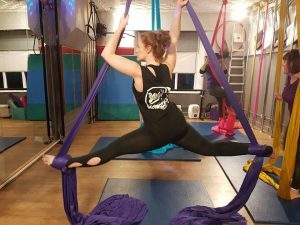 I joined Tempest in March starting with Aerial Yoga and Strength and Conditioning classes. It’s been just over sixth months now and I have loved every minute. What has kept you interested in pole/aerial? I have tried lots of different courses to try and work out which style I prefer. I find though that I learn something new each week and love seeing the amount of progress I make. It’s great to get a move but there always seems to be another step. What is your biggest Pole/Aerial achievement? I have finally managed to invert on the silks which was always a nemesis move. However, I feel that the confidence I have gained from doing this and not being afraid to try a new move is my main achievement. I have definitely developed a ‘can do’ attitude. What do you like best about Tempest Studio? The main thing that keeps me coming back to Tempest, and loving doing this so much, is the people. Everyone is so friendly and so encouraging. I always come away from the studio with a smile on my face and always have such a laugh. The instructors are brilliant and so helpful and good at what they do. It really is a little family. I love so many but I like Star on the Bar on the Hoop, Figurehead variations on the Silks, Gazelle and Mermaid on Trapeze. Ohh and in Aerial Yoga I like inverted Baddha Konasana (Cobbler Pose). Holding a good solid straddle and getting there without putting my toes on to help. I will one day have the strength to pull up. Don’t be afraid to try and ask if you’re not sure. Everyone is so helpful and will encourage you. Most importantly don’t compare yourself to others, we all have moves that we struggle with, just develop at your own pace. How have you changed since joining #TeamTempest? Apart from being a major aerial addict and loving being upside down, I am much more confident and keen to give things a try. 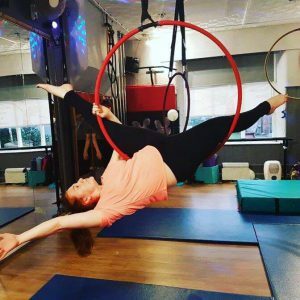 I have tried Aerial Yoga, Aerial Silks, Aerial Trapeze, Aerial Hoop, Pole, Burlesque and Strength and Conditioning classes. There is always so much on offer and to get involved with at Tempest. It’s always worth trying something new!